Kobolds are weak, craven, and see the with a festering resentment for the rest of the world, especially members of races that seem stronger, smarter, or superior to them in any way. They proudly claim kinship to dragons, but beneath all the bluster, the comparison to their glorious cousins leaves kobolds with a profound sense of inadequacy. Though they are hardworking, clever, and blessed with a natural talent for mechanical devices and mining, they spend their days nursing grudges and hatreds instead of celebrating their own gifts. Kobold tactics specialize in traps and ambushes, but kobolds enjoy anything that allows them to harm others without putting themselves at risk. Often, they seek to capture rather than to kill, taking out their frustrations on the helpless victims they drag back to their claustrophobic lairs. 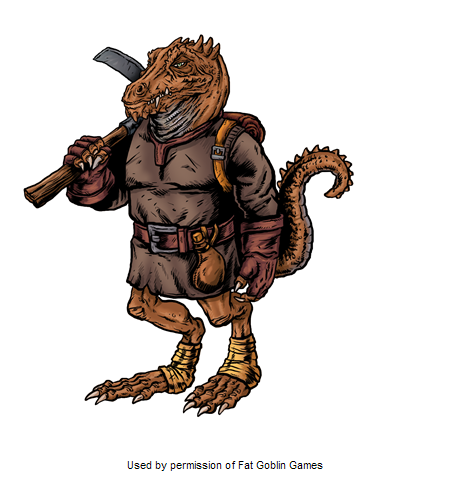 Physical Description: Kobolds are small, bipedal reptilian humanoids. Most stand around 3 feet tall and weigh about 35 pounds. They have powerful jaws for creatures of their size and noticeable claws on their hands and feet. Often kobolds' faces are curiously devoid of expression, as they favor showing their emotions by simply swishing their tails. Kobolds' thick hides vary in color, and most have scales that match the hue of one of the varieties of chromatic dragons, with red scales being predominant. A few kobolds, however, have more exotic colors such as orange or yellow, which in some tribes raises or lowers an individual's status in the eyes of his fellows. Relations: Kobolds often seethe with hatred and jealousy, but their innate caution ensures that they only act on these impulses when they have the upper hand. If unable to safely indulge their urge to physically harm and degrade members of other races, they resort to careful insults and “practical jokes” instead. They consider both dwarves and elves to be deadly rivals. Kobolds fear the brute power of half-orcs and resent humans for the dominant status that race enjoys. They believe half-elves blend the best qualities of both parent races, which strikes kobolds as fundamentally unfair. Kobolds believe halflings, small in stature, make wonderful slaves and targets for kobold rage and practical jokes. When the gnomes first arrived in the mortal realm, kobolds saw them as perfect victims. This sparked waves of retaliation and reprisal that have echoed on down through the centuries and earned the kobolds' permanent enmity. Ability Score Racial Traits: Kobolds are fast but weak. They gain +2 Dexterity, –4 Strength, and –2 Constitution. Day Raider You're one of the few kobolds born with a greater tolerance for sunlight. You don't have light sensitivity, and you have low-light vision instead of darkvision. This racial trait replaces light sensitivity and darkvision. Dragon-Scaled Some kobolds are hatched with scales of such vivid color that their connection to a particular sort of chromatic dragon seems undeniable. Whether this coloration is just a quirk of a stray egg or a trait shared by all the members of a tribe, these kobolds gain a resistance that makes them especially suited to work alongside dragons matching the color of the kobold's scales. Black-scaled and green-scaled kobolds with this racial trait gain acid resistance 5. Blue-scaled kobolds with this racial trait gain electricity resistance 5. Red-scaled kobolds with this racial trait gain fire resistance 5. White-scaled kobolds with this racial trait gain cold resistance 5. This racial trait replaces the armor racial trait. Echo Whistler By observing the noises in underground tunnels, you learned to uncannily mimic any voice or sound you heard. Three times per day, you can attempt to trick someone in this way by making a Bluff check against the listener's Sense Motive check. You get a +2 circumstance bonus on this check if you're in tunnels or other structures where your voice can echo. This racial trait replaces crafty. Prehensile Tail Your tail is especially flexible and strong, so you've learned to use it for both movement and simple tricks. You gain a +2 racial bonus on Acrobatics and Climb checks, and you can use your tail to draw a hidden weapon as a move action instead of as a standard action. This racial trait replaces the armor racial trait. Shoulder to Shoulder Having lived and worked in close quarters with your tribe-mates, you've learned how to maneuver within their personal space without disturbing them. You can occupy the same space as one other Small ally without penalty. If you share a space with another kobold who has this trait, you each gain a +1 circumstance bonus to AC, as you help jostle one another out of the way of incoming attacks. You also gain a +1 racial bonus on aid another rolls. This racial trait replaces crafty. Wild Forest Kobold You're one of the barbaric kobolds dwelling in the forests of the surface world. Your culture shuns artifice, but teaches how to endure the hunt. You gain a +2 racial bonus on Perception and Survival checks, and Stealth and Survival are always class skills for you. This racial trait replaces crafty. Bard Treat the bard's level as +1/2 level higher for the purpose of determining the effect of the fascinate bardic performance. Cavalier Add 5 feet (up to 15 feet maximum) to the cavalier's mount's speed when it uses the charge or withdraw action. Druid Add +1/2 to the druid's wild empathy bonus. Monk Add +1/3 to the monk's AC bonus class ability. Ranger Add +1/4 to the number of opponents the ranger may select when using hunter's bond to grant a bonus to allies. All selected creatures must be of the same type. Rogue Add +1/2 to the rogue's trap sense bonus to AC. Summoner Add +1/4 to the summoner's shield ally bonus (maximum +2). Wizard Add 1/2 to your familiar's Will saves against enchantment effects, or increase the hit points of your bonded item by 1. Kobolds are zealously proud of their draconic heritage, and make much of the physical similarities they share with those regal monsters. One of the most obvious similarities between the two races is their distinctively reptilian scales, which come in five chromatic colors. As with dragons, the color of a kobold's scales often corresponds to a variety of innate abilities, tendencies, and personality traits it possesses. Scale coloration plays a subtle yet vitally important role in relationships both between kobold tribes and within them. Though the majority of kobolds exhibit one of the five major chromatic colors, occasionally individuals emerge with alternate pigmentations, with the most common being purple, orange, and yellow. Those who possess the rarer colors described below are discriminated against by their homogeneous tribe-mates, but these colors do have unique benefits. In addition to the attested colorations listed below, translucent-scaled kobolds are rumored to exist, but these “ghost kobolds” haven't been encountered in centuries.